Recently I was offered to try out a Zyclone — one of the newest products by Zing Toys, a toy manufacturer based outside of Portland, Oregon that specializes in active-play toys. I love to learn about toy companies that are dedicated to creating toys that encourage children to be active. When shopping for toys for my middle son,who is 10 and love to be outside, I seem to have trouble finding good quality outdoor toys. 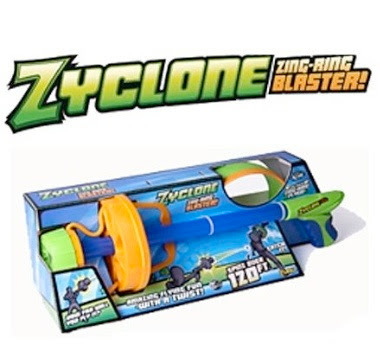 The Zyclone is a ring blaster that shoots a foam ring that glides in a straight line for over 100 feet. Yes I said OVER 100 feet! See the Zyclone Zing Ring Blaster in action !! When we got ours in the mail, my he was excited to give it a try. We head outside to give it a try. To use the Zyclone Zing Ring Blaster all you have to do is load the Zing Ring onto the front, pull back while twisting and release. Due to the twisting motion it causes the Zing Ring to rotate at a fast rate allowing it to travel at a distance of over 100 feet. I am not sure if the rings went 100 feet or more but it did go far. My toddler enjoyed running to get the ring and bringing it back to his brother. Over all I think the whole family enjoyed taking turns. My favorite part of the Zyclone Zing Ring Blaster is that it encourages kids to get outside and off the the sofa and to put down the video games plus.......... it is great exercise ! This year I'm struggling with gift ideas for my 10 year old. John would LOVE this...I'm off to check it out! WE have this and it's a lot of fun! This toy is very cool. Just make sure you have the ring facing the correct way when playing.